DRAW Decal has announced three new decals over the last week, all of which have been added to my eStore, and are available to order. 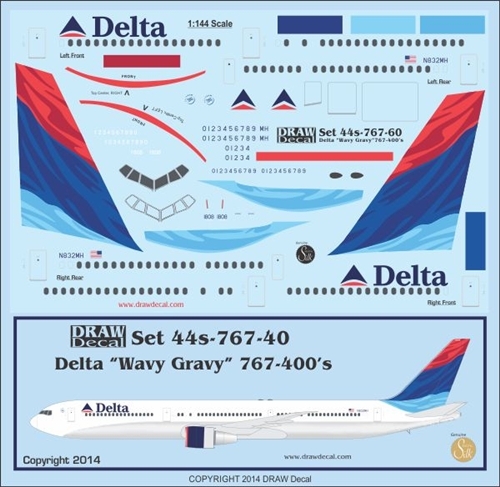 First, the Delta Boeing 767-400 in the ‘wavy tail’ scheme is available in 1/144 scale (DW44-767-060) and 1/200 scale (DW20-767-060). In 1/144 scale, this decal fits a converted Revell Germany or Zvezda kit, modified with the BraZ conversion. In 1/200 scale, it fits either a refinished Hogan (or other) snap fit 767-400 model. Second is the Saudia Cargo Boeing 747-800F, available in 1/144 scale (DW44-747-051) and 1/200 scale (DW20-747-051). In 1/144 scale this decal will look great on the soon to be released Revell Germany Boeing 747-800F kit (RV4885, eta for release May 2014). In 1/200 scale, it will fit a repainted Hogan or other 747-800F. Finally, sets have been released for the Delta Airlines Boeing 737-900, available in 1/144 scale (DW44-737-146) and in 1/200 scale (DW20-737-146). In 1/144 scale, convert the Revell Germany 737-800 kit to a series 900 either by adding extra fuselage length from a second model, or by replacing the fuselage with the Contrails resin fuselage (CM44-737-900). In 1/200 scale, the choices are to convert a Hasegawa 737-700 or -800, or repaint a Hogan or similar 737-900 model. All six sets will be in stock shortly. They are all available to order now, and will be shipped on a first ordered first sent basis. 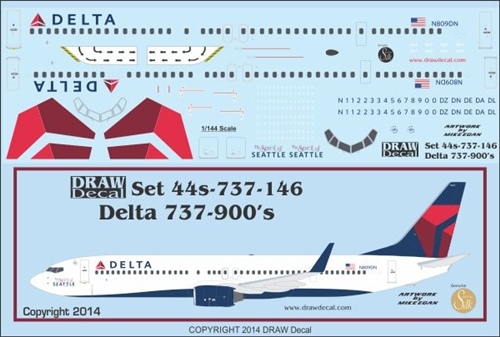 This entry was posted in New Decals and tagged 737-900, 747-800F, 767-400, Delta Airlines, DRAW Decal, Saudi Airlines. Bookmark the permalink.